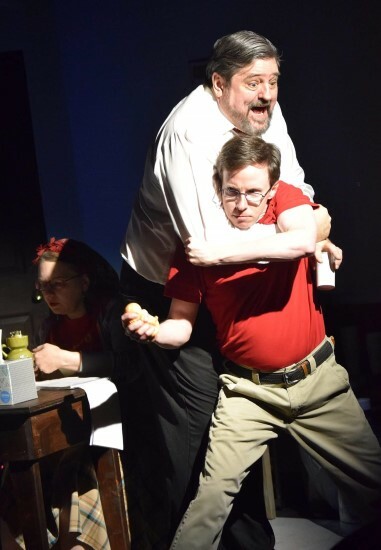 “12 Incompetent Jurors” by Ian McWethy, directed by Ilene Chalmers and produced by Maureen Rogers is now in session at Laurel Mill Playhouse on Main Street in Historical Laurel, MD. The nutty comedy is a satirical version of the play and movie “12 Angry Men,” now sometimes called, “12 Angry Jurors” as women are cast as jury members in our more inclusive world. The plot is simple. A man has been brought to trial for stealing 6 cats. It is an open and shut case. The Judge (Lorraine Brooks) tells us that right from the start. There is ample evidence, including a videotape of the act, eyewitnesses and a confession on the witness stand by the accused. It should be simple, right? Well, that would not be much of a story. Of course, one juror, Juror Eight (Brian Douglas) votes not guilty. He then tries to sway the other eleven to follow his lead. Without revealing too much of the strange plot, just think of the phrase, “Are you going to believe me or your lying eyes?” Whether intentionally, or on accidentally, McWethy explains how many in this country, in this world, can look at facts and be convinced that they are not the Truth. However, this is not a serious satire as there is everything you expect in a real farce, including some strongly choreographed physical comedy. Chalmers is a fine comedic director, and this show is no exception. What makes this really a fine production is the cast. They all stay in character and continue the little idiosyncrasies they had developed for their parts even when they are just sitting and listening. Stephanie Ichniowski is the Foreman and a very unlike one. She is the youngest of the group, an aspiring, not particularly talented, actress. Ichniowski is talented and makes this juror a twit to remember. Fred Nelson is Three and is the sane member of the group who understands this is a cut and dry case. Nelson goes from confident, to incredulous, to angry and then to resignation while keeping the play light and funny. He is the straight man in all this, and a great foil for the other off the wall characters, who look like they belong more on Jerry Springer than Law Order. As the thorn in the side, Juror Eight, Douglas brings dignity to this very annoying character. Douglas makes us believe this character is smart, persuasive and, sometimes, diabolical. We wonder about this jurors sanity at times, but never his ability to change the minds of others. Rebecca Kotraba distinguishes herself as Two, the most neurotic of the 12. The character tells us she suffers from anxiety, and Kotraba has her twist her hair and tap her foot even when she is not the focus of attention. In her big scene where she takes the stage to express Two’s opinions, she keeps the character funny without being pathetic. Malarie Zeeks is Four. The one who really is the misfit. This millennial does yoga in the midst of all of this, texts on her cell phone and is takes selfies even during some of the mayhem. Zeeks is also a standout as she makes us think this woman is so self-absorbed that justice is just an annoyance in her life. Five and Six are a married couple, played by a married couple in real life. You have to suspend belief a little to accept that a married couple would be allowed on a jury, but Alan and Penn Barnett may have the hardest job as their characters are a little stereotypical. However, the two are so funny that we forgive some of the gangster and Jersey Shore attitude. Also playing a character that could be over the top, and doing it well is Reed Sigmon as Seven. Sigmon’s character plays video games and has crushes on lawyers. He is also gay. Sigmon cleverly walks the line and keeps the character from being too offensive, bringing great humor to the role. The real spooky juror, Nine, is portrayed with manic aplomb by Ronald Araujo. Covered in tattoos and eating French Fries, Araujo makes him frightening and comical. We always feel Nine may be the one who should have been on trial for his own misdeeds. Additionally, on the verge of explosion is Ten, played by LMP veteran, Nik Henle. Henle’s portrayal of this strict law and order individual is also hilarious. When he predictably explodes, Henle takes it over the top. We find him laughable not scary. Would a play full of wild, off-beat characters be complete at LMP without Terri Laurino? Laurino plays the uneducated but successful press agent for the stars, Eleven. Giving dimensions to these type of roles is her specialty, and again, Laurino seems just perfect for the role. Rounding out the jury pool is Ruta Douglas Smith, an Eastern European naturalized citizen, who only has a rudimentary knowledge of the American judicial system and is more interesting in smoking than deliberation. Smith has wonderful comic timing and again, watch her when others are the focal point. She has a lot of comical little things she does. The cast rounds out with Brooks who does a great job in the small role as the Judge. The only flaw is I would have liked to have seen more of her. Chalmers is a fine comedic director, and this show is no exception. The pace is quick and the timing is there for many, many side-splitting scenes. Chalmers and her husband David Chalmers designed and built the set, respectively. It certainly looked like an old New Jersey jury room. I know as I actually sat in one once. I think that picture of President Ford was there then and also crooked. Ms. Chalmers is also responsible for Light Design. Sascha Nelson’s costumes, hair and make-up help create all the zany characters. Their bright colors kept the play set in this drab room from being dull. Seven’s rhinestone shoes and Nine’s tattoos and wild eyes and hair, are the finest examples of her attention to detail. If you have ever seen 12 Angry Men (Jurors), watched a courtroom drama or a courtroom reality show, you will find this farce outrageously delightful. If you are the one in a thousand who has not, you will still have plenty of laughs. Running Time: One Hour and 50 minutes with an Intermission. Note: Susan Brall has had a theatrical relationship with Laurel Mill Playhouse.